We'd like to welcome Disney Modeler Ryan Tottle. Ryan, can you tell us a little about your background and how you became a 3D Character Modeler for Disney? I continued for a few years as a freelancer in Makeup effects, sculpting prosthetic appliances (old age makeup etc) and big rubber monster suits. I kept sculpting my more personal work in my spare time, building a more refined portfolio. Meanwhile: I'm in contact with Alena Wooten, who I met on Deviant Art and we become good friends. 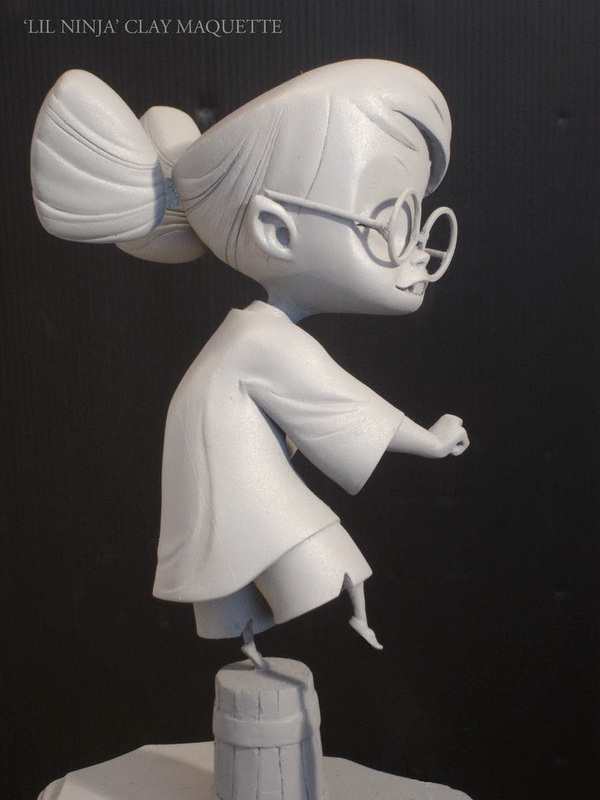 She was working at Blue Sky Animation Studios as a maquette sculptor. RyanTottleSHOWREEL2010 from Ryan Tottle on Vimeo. In 2008 I got invited to work on a horror movie at Plan 9 FX in Madrid, by my friend Valentina Visitin. We'd been working together at Neill Gorton's Millennium FX in London. I spent a few months in Spain and Alena came to visit me. I remember she brought a Scrat Maquette to show me (sculpted by Michael Defeo) it was primed grey and the light rolled over the forms so elegantly. It reminded me of studying the animation maquettes in college. 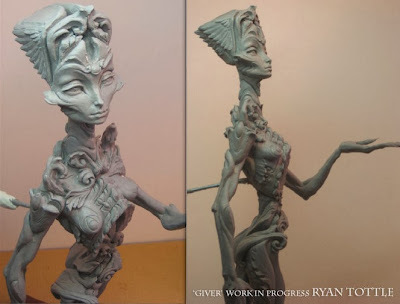 I actually always had an interest in those sculpts, they seemed to be a more minimal approach to sculpting. They were more subtle and selective in their forms and so full of character. Once the project in Madrid was over, Alena invited me out to stay in New York for a few months where I was introduced to Lots of very inspiring Blue Sky artists. Michael Defeo was Alena's supervisor at the time and we hung out. Alena and Mike shared their knowledge of sculpting 3D characters, it was very inspiring. Mike had mentioned how much I could benefit from learning 3D modeling software, especially Zbrush, since I'd been working in clay for my career to date. So, I got to work on teaching myself Maya and Zbrush through online tutorials and help from my friend David Strick (who was at Blue Sky at the time). I moved to New York in 2009 to Marry Alena. When I first arrived, I couldn't work for 3 months because of immigration reasons, so I kept working on my portfolio and making Zbrush characters. Once I could work, I was hired by Tony Jung to help work on game characters at Kaos Studios in New York City. This is where I further refined my knowledge of CG. 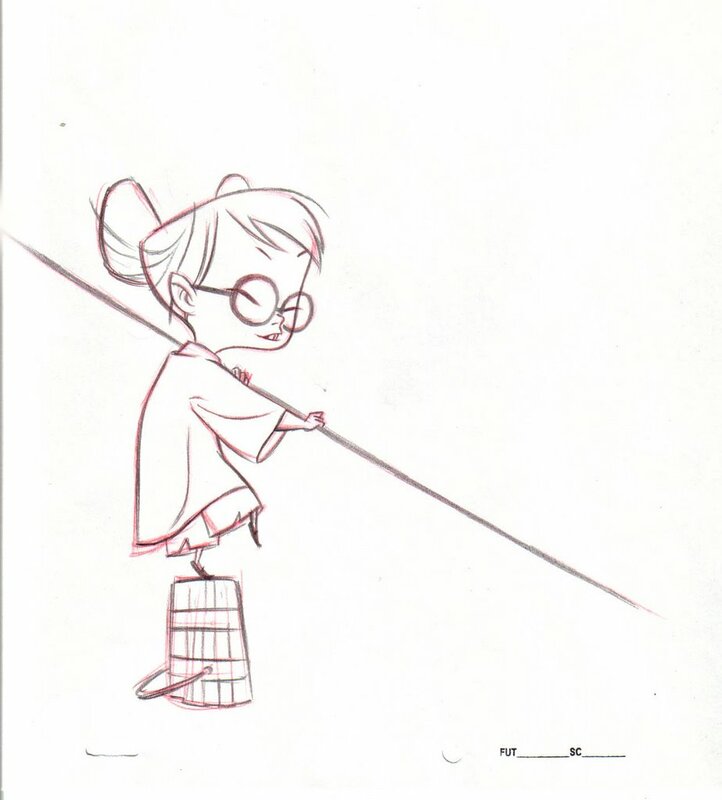 In early 2011 I got an email from Shiyoon Kim from Walt Disney Animation Studios, asking if I was interested in applying for a modeling position. It turns out that he'd seen one of my maquettes based on his character design. So, I applied and got hired as a Trainee to learn the 3D animation pipeline. 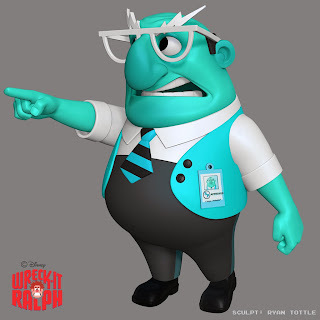 I later got hired as a Modeler on Wreck-it-Ralph, and I've been at Disney ever since. 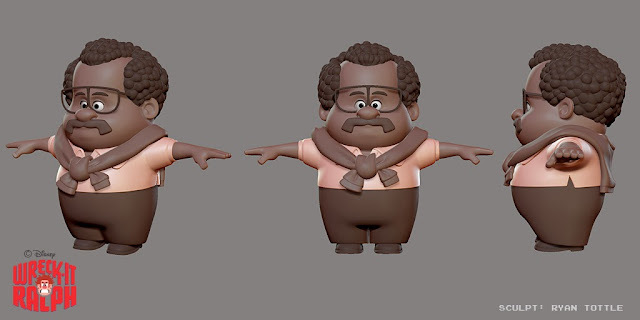 What were some of the challenges going from sculpting in traditional clay to 3D Modeling in ZBrush and Maya? How did you work through those challenges? Are there any tips you've learned along the way? I think the most challenging part for me was learning the software and the principles of CG. It was like learning a new language, a different way of thinking. But, being familiar with sculpting three dimensional form helped me see the light at the end of ever growing tunnel. Learning what a vertex is, is pretty weird when you've never had to think in that way before. It just came down to repetition, doing it every day for hours on end. It took me about 2 years to say "now I'm comfortable to say I can sculpt in CG to the quality I can in clay." It's never quite the same obviously, they have a different look, it's subtle. Another challenge for me was the rendering side of things. A physical sculpture is always rendered with real world light and shadows, which is always way better for reading how light falls on the surface. So, I like to print out the models to get a real feel for the forms. My advice is to do both physical and digital. Clay sculpting feels like a mental workout for me now, I try to do it at least one night a week. 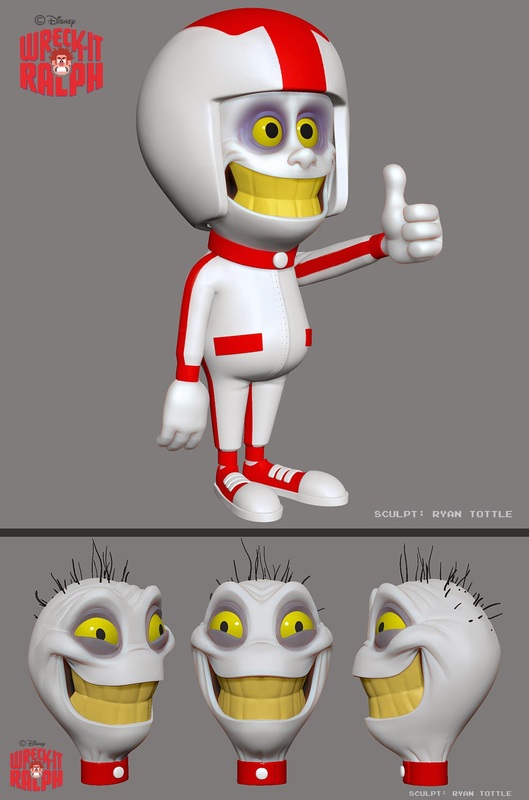 How do you think having a traditional sculpting background has helped you in the 3D Modeling Industry? It has helped a lot. I found that having an understanding of the principles of sculpture made it easier to figure out the forms in a 3D software. I guess it's just the amount of practice I've had working on 3D objects in the physical. It seems to be the same reason that things like life drawing are always recommended. It gives you a real tangible perspective on how to model shapes. Zbrush has made this a faster process for me though, less labor intensive. It's less about moving actual material around, it can happen instantly in a 3D software. With having work experience in modeling game characters and feature characters, what are some of the similarities and differences in modeling in the two industries? In my experience, there has been a pretty big difference. Mainly in that a lot of the games are going for a hyper real look these days. Sculpting those characters was more similar to my makeup FX days. The characters were more organic in their shapes and were generally less criticized than animation characters that tend to have more of a clean, simple, graphic, feel. There seemed to be more room for error on hyper real characters. I found organic sculpting can be quite forgiving at times, especially when there are a lot of textures on the surface. When sculpting 'simple' 'toony' characters, you are in a sense given a more limited palette of shapes to use and each curve/edge is super subtle and can make all the difference to the success of the piece. The other thing is that game characters are usually made with triangulated meshes and animation characters are usually quad meshes, which can be subdivided for render time, so it's a bit of a different challenge. I found working with triangles a bit less intuitive to get the forms I wanted. There's something I find more natural about the flowing edge loops of quad meshes, and they're nicer for sculpting in ZBrush, they smooth more predictably. There are similarities of course, you still have to apply a lot of the same aesthetic rules and techniques to make a nice model, and try to hit the concept art as closely as possible. Can you talk a little about your experience going through the Disney apprentice program? Yes, it was a great experience because it gave me the opportunity to learn more about the pipeline at Disney Animation, and 3D animation in general. I had never worked in the feature industry before. We had the opportunity to go to all kinds of lectures on principles of animation, appeal, design etc. Also, you're assigned a mentor, who you can reach out to for any questions or help if you need it. A lot of legendary people still walk the halls in that place, so you can become a sponge of knowledge and ramp up at a steady pace without being thrown straight on to a production. I highly recommend it, it's a great way into the studio. What do you enjoy working on outside of work? Can you share some of your personal projects? I'm constantly sculpting and refining my sculpting skills. I also like to collaborate with other artists, I find that you can learn a lot this way. I'm a big enthusiast of fantastic realism and Visionary art, and have been working those things into my personal sculpture. It's kind of the other end of the spectrum in terms of what I do in animation. I think that most commercial artists have their own personal side projects that interest them for different reasons. It's actually good to do this because the things you learn on each side, you can apply to the other. At the moment I'm working of a series of 'Beings' who's anatomy is constructed (sculpturally) from architectural and symbolic shapes from various wisdom traditions, merged with the more classical feel of western sculpture. I don't have much time to work on these at the moment, but when I do it's a great treat. 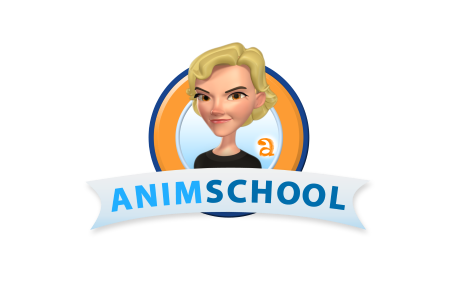 Do you have any advice for those students studying to be 3D Modelers? Practice a lot and make it fun for yourself. Look at the best work you can find in the industry and aim for that. Ask a lot of questions. Be very specific about what you want as an end goal. 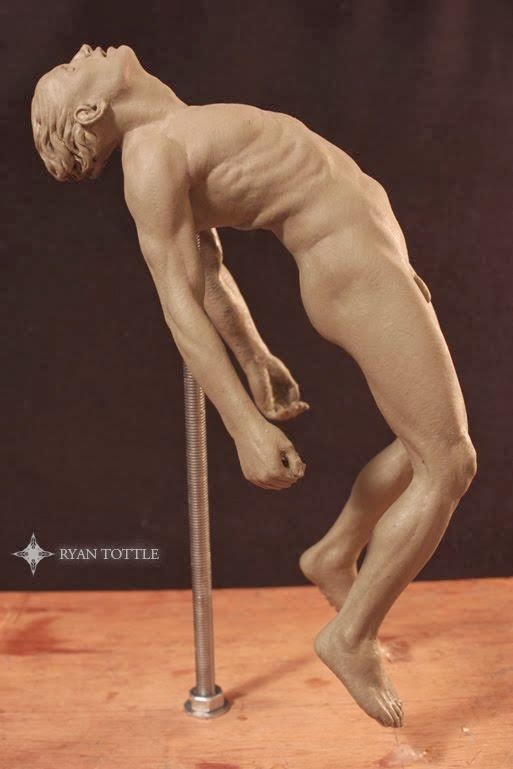 Study as much classical sculpture, anatomy and industry work as you can handle. When making a reel or portfolio, only show a few things that are your very best. Keep it short and sweet because the people who review your work are usually very busy, and are probably going to scrub through it if it gets long and boring. Try to catch their eye right away. 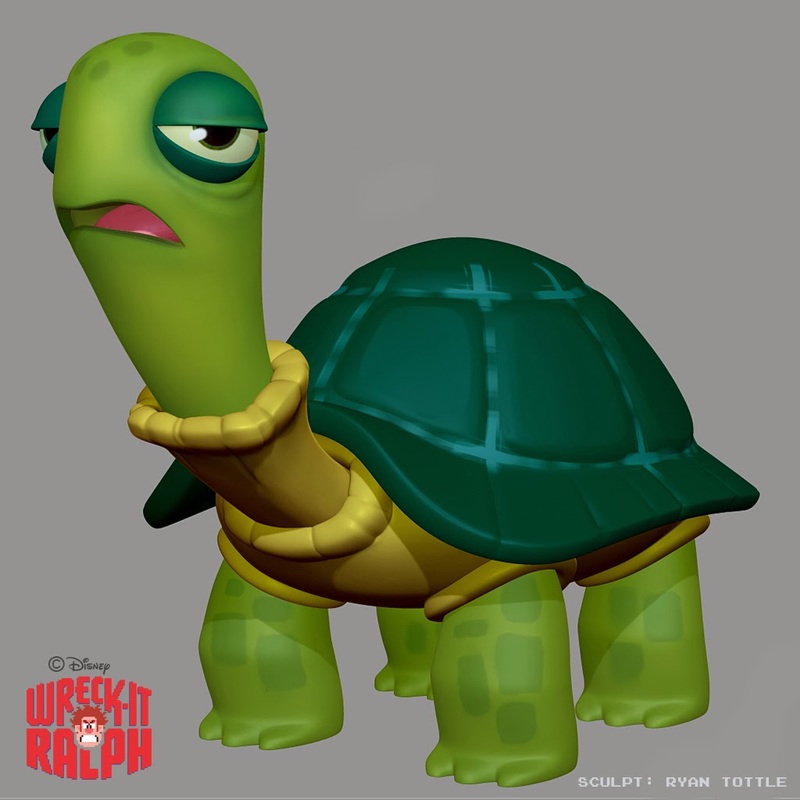 In AnimSchool's Introduction to 3D Lighting class, Blue Sky Studios Lighting TD, Brandon May shows how to create a light wrap on a character.